Dutch design and handmade gemstone bracelets in several shades of green. The sterling silver (925) details are the finishing touch of our jewelry. Do you want to know more about gemstones or send an email to our graduate gemologist Laetitia. 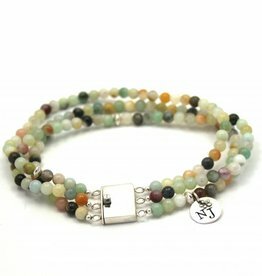 Handmade bracelet of three rows amazonite and sterling silver clasp. 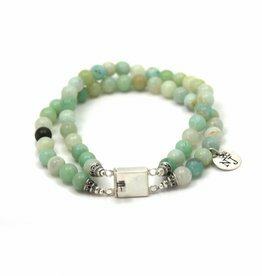 Amazonite bracelet, two rows with sterling silver details. 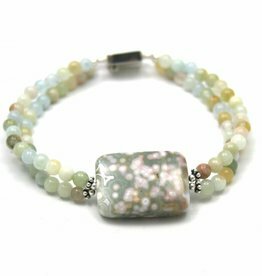 Bracelet with the rare Ocean Jasper with lovely pattern and beryl beads. Bracelet handmade of natural turqoise with sterling silver details. Beautiful handmade bracelet of amethyst and peridot, designed by NJAmsterdam. 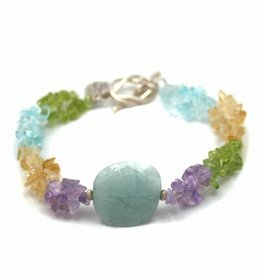 Handmade bracelet with a beautiful large 'milky' aquamarine and beads of amethyst, citrine, peridot and topaz. 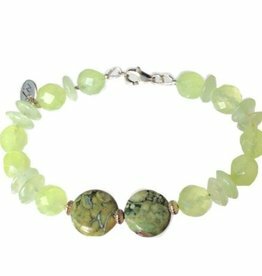 Beautiful yellow prehnite bracelet with green ocean jasper.